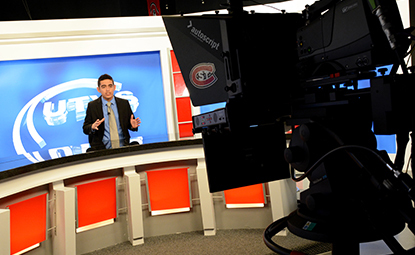 As a mass communications student you'll find a multitude of options for study in your preferred media field – television, radio, print, web, social and digital media, public relations or advertising. You've chosen a field that is constantly evolving in theory, strategy and technology. Your classrooms and faculty are evolving, too. You'll mix classroom instruction with hands-on experience in the latest techniques and technologies. You'll be mentored by faculty, many who also work as media professionals. You'll build skills and practice your craft at award-winning campus television and radio stations, web and print publications. Practical internships provide an additional stage. Updated and renovated HD television facilities that include two production studios, three sports venues, two production control rooms, a central equipment room, media room, master control center and 12 editing suites. Centrally-located radio (88.1FM KVSC), television (UTVS) and newspaper (University Chronicle) facilities, as well as computer and photo labs in Stewart Hall. Advanced software including InDesign, Photoshop and Illustrator. Top National Academy of Television Arts & Sciences (NATAS) and Broadcast Education Association awards for UTVS-TV. Numerous American Advertising Federation ADDY Awards awarded to advertising majors. Society of Professional Journalist awards for print, radio and television productions. One of two Minnesota schools with accreditation by Accrediting Council on Education in Journalism and Mass Communications. KVSC radio has 45-years-plus history in sports and news broadcast. Notable alumni: Clay Matvick '96 is a sportscaster for the ABC and ESPN networks; Tina Gust '97 is vice president of business development at Minor League Baseball.